Let the record state that we highly approve of collaborative art pieces. Music and dance have been a match made in heaven since the beginning of time. What has changed in more recent years is the presentation and medium in which it is delivered. One of those mediums being live demonstrations. Take it a step further and you arrive at a cappella performances accompanying dance routines, which provides an exceptionally expressive experience. The Lowkeys of Harvard University supply all of this in their newest cover of "Love on the Brain/Higher" a mashup of two popular Rihanna songs. 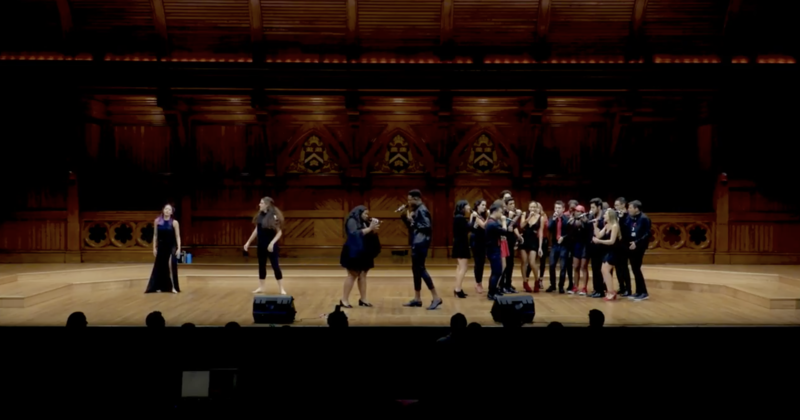 The singing itself is fervent and mesmerizing as the group features two showstopping soloists whose voices are as big as the hall they are performing in. There's so much personality and emotion oozing from their vocals that they could bring the most unrelenting soul to their knees. It's a bit gospel, a touch of pop, with a hint of blues. The Lowkeys' music also makes a wonderful backdrop for their two guest dancers, who deliver a flawless and graceful routine that pairs well with the ebb and flow of the song. The combination of music and dance is fluid, nuanced and well-executed. It's a comforting masterpiece that you should revisit over and over again.